A new site, tons to write and post about. This is not a “news” site at all. In fact, it’s more of a way for me to get my thoughts out on one of my favorite hobbies: Video Games. But not the latest and greatest games, although I may (and probably will) write about those. But all video games, the ones I enjoy. That may be current games, or older games. It could be console games, or arcade games. My tastes run wide. At the moment, most of my video game playing time goes two ways: classic arcade titles via MAME, and some iOS games. On the arcade front, this started recently. I have always loved arcade games, but as a Mac user, the MAME support is just not there. And I was not willing to buy a full PC just to play a few MAME games on. I always wanted some arcade games, but space and cost have always been an issue. I honestly thought it would be way too expensive to own an arcade machine. And even if it was not, space is at a premium in my home, and I’m not sure where I would fit one. I ran across, and subscribe to, a YouTube channel called John’s Arcade. In it, John Jakobson shows off his basement arcade, visits different arcades around the country (and world lately), and restores older Arcade machines. It’s the later that made me subscribe to his channel. It’s something I am interested in, but have no experience at doing. Maybe when I buy a new, bigger home, I will have the room and can look at buying a couple arcade machines and fixing them up myself, using some of the techniques I learned from John’s YouTube channel. Still, the bug was there, and I started pursuing Craigslist for use arcade machines. There are quite a few in my area, but most are too expensive. But I did come across one that sounded right up my alley: a headless MAME cabinet! 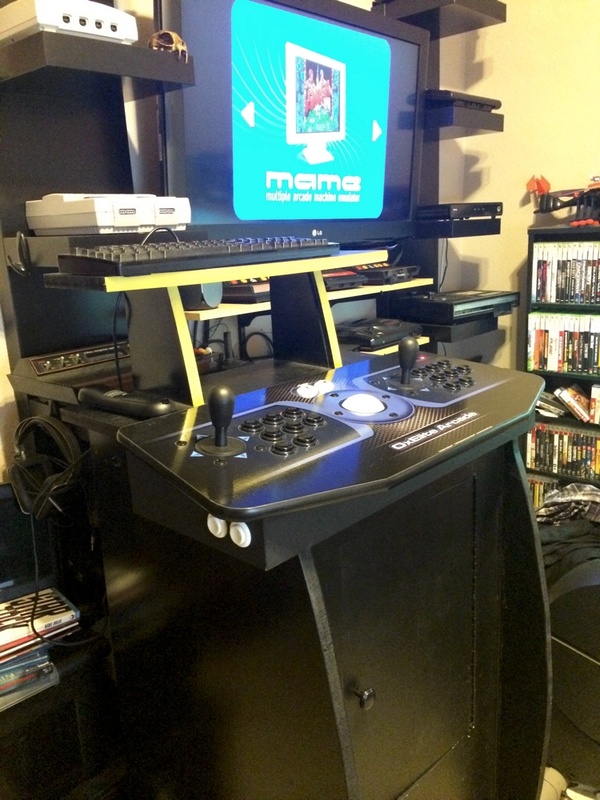 What’s a headless MAME cabinet? Well, it’s an arcade machine with no monitor, with a control system, and a PC running the software. This was a no-screen Samsung laptop running Maximus Arcade. Included was the complete setup, with MAME, a bunch of Nintendo Consoles, and a couple others. All ROMs included. The cost? Not expensive. And the best thing? Only about five miles away. After a little back and forth, I ended up buying the cabinet. The headless cabinet was custom built, included some speakers and a sound system (neither of which I have ever used), a X-Arcade Tankstick + Trackball, and the aforementioned Samsung laptop running all the software. Really, plug and play! I already have one wall dedicated to my video games. There is a 40” LG LCD TV on the wall, surrounded by some IKEA shelves holding my classic video game consoles, and some shelves under it holder more modern consoles. (Look for another post where I go into much more detail on all that.) I just ran an HDMI cable from the Samsung laptop to the LG TV, and viola! I am playing arcade games of my youth! And that’s where the fun, headache, and hours of tinkering began. And that is where I end this first post! This entry was posted in Arcade by Tim Robertson. Bookmark the permalink.